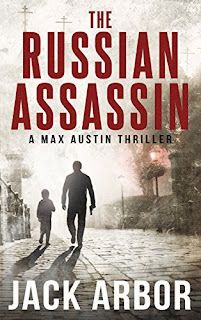 The Russian Assassin: A Max Austin Thriller, Book #1 by Jack Arbor. Former KGB assassin Max Austin's peaceful life in Paris is shattered when his mother's imminent death brings him back to a world he only wants to forget. Before he's even unpacked his bags, a brutal act of terrorism sends Max running for his life and forces him to uncover secrets about his father's past to save his family's lives. Max's sister and nephew become pawns in a game that started a generation ago. As Max races from the alleyways of Minsk to the tony neighborhood of Zurich, and finally to the gritty streets of Prague, he must confront his past and come to terms with his future to preserve his family name. If you like intrigue, twists, and high-octane excitement, you'll love this tight, fast-paced adventure, starring Jack Arbor's stoic hero, ex-KGB assassin-for-hire Max Austin. This thriller is based on an ex-KGB assassin, Max, who on the behest of his sister, is coming home from Paris to see his dying mother but just as he arrives a bomb goes off, killing his whole family save for his sister and child. The remainder of the novel focuses on Max as he pursues those responsible for his families tragedy whilst trying to uncover the reason why they were targeted. I've read a few hitmen/assassin type books and I have to say this is one of the better ones. I enjoyed the quick, efficient style of Jack Arbor's writing and the story flowed easily from one plot to the next. The action scenes were well described and Arbor kept it simple, which I appreciated. As for the main character, Max, I thought he was a superb protagonist. He was good at his job, but he wasn't infallible, and whilst I obviously didn't expect to see him killed off, I got some suspense on whether or not he'd be able to rescue/protect those he cared about. Another point I liked about Max was that he wasn't narcissistic or egotistical - I've read my share of books where authors portray their main character's as the next coming of James Bond, which invariably involves nothing more than endless skirt chasing and posing. If you're into your fast paced action novels with a healthy dose of mystery then this book will be perfect for you. Jack Arbor's a talented author who I'll be keeping an eye on.